Winter comes and you've worked hard your entire life to afford a two-car garage in which you can park the cars in said garage during the winter but the garage is filled with household clutter. In fact, if this adequately describes your current situation, you'd be part of the 25% of Americans who cannot park their cars in their two-car garage because it's filled with clutter. We can promise you that in this info-graphic you'll discover household clutter statistics that will make you think about the items you'll keep around the house. Going forward you'll be more likely to do yearly household de-cluttering, perhaps with a Bin There Dump That dumpster. Check out the infographic below to discover how less clutter in your house can lead to paying your bills on time, eliminating the need for costly storage units and eliminate a significant percentage of your routine household chores. 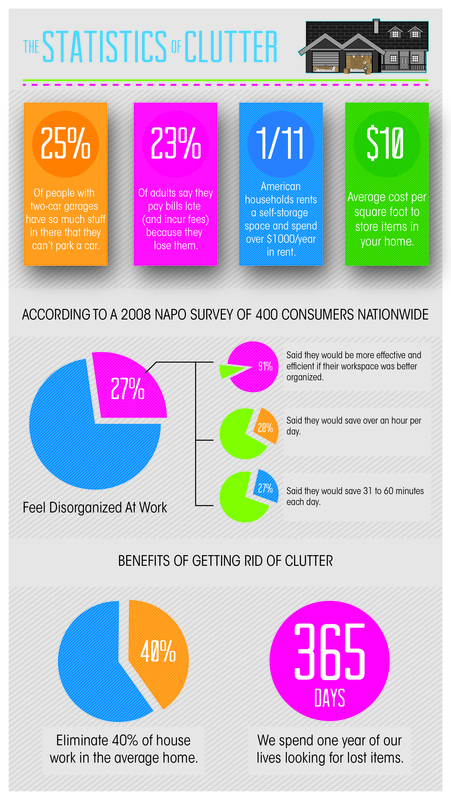 So, I bet you are more inclined to declutter now, right? Leave a comment on which stat had the greatest impact on you and your strategy to combatting clutter going forward.